Get ABC Warehouse Black Friday sales up to 65% off storewide; $948 LG 60″ Class 1080p 600Hz Smart HDTV; $238 Vizio 32″ LED HDTV with 2xHDMI; all roaster up to 50% off; $997 Whirlpool 25cu. 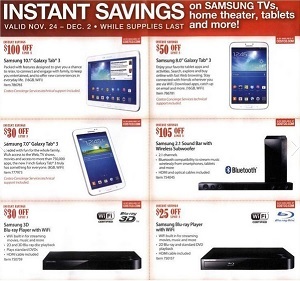 ft. French door refrigerator; $9.88 Belkin N150 wireless router; $139 Amazon Kindle Fire 7″ tablet; $69 Yamaha 8″ powered subwoofer with 100 watts dynamic power; $279 Samsung Galaxy Tab 3 8″ Bluetooth; $479 HP All in One PC with 20″ HD LED widescreen and 500GB hard drive; $19.99 DigitalFilm 16GB USB flash drive; $44.88 wireless 2.4Ghz Quadcopter; $39 Portable karaoke player; $19.99 Sony portable AM/FM radio; $799 Panasonic 55″ 1080p 600Hz Smart HDTV; $498 Sony 4K Ultra HD media player with 10 pre-loaded films; $399 Bose Solo TV sound system; $268 Samsung 29″ Slim LED HDTV; $69 iLive 2.1 channel Bluetooth soundbar; save $600 on Sony 65″ Class LED 1080p Smart 3D HDTV with free 3rd party streaming services for months and music; $357 GE frost free 18cu. 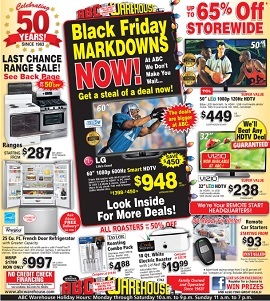 ft. refrigerator; $6.88 3 piece cookie pan set; $397 GE king size capacity washer; $79.95 Waring electric meat grinder; $7.88 large non-stick roast pan; 50% off LG gas range 8000 BTU center burner; and more. 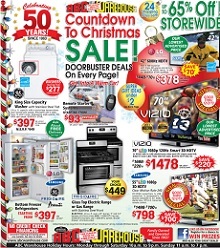 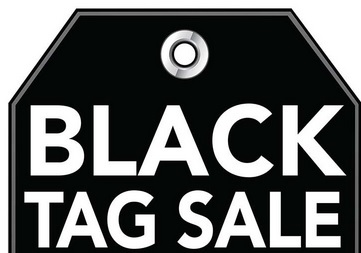 Check all ABC Warehouse Black Friday early deals and sales 2013 on abcwarehouse.com.